Kristi and Jewell Knight are a dedicated "Mother and Daughter Team" who are committed to providing comprehensive, professional, and full-service to every client. Both are licensed Brokers in North and South Carolina, and each hold the ABR, GRI, CRS, E-pro credentials to better serve their clients. Kristi and Jewell Knight are consistently multi-million dollar producers, recognized as top producers in sales & listings, and the #1 Mother and Daughter Team on the Grand Strand. The Knight Team specialize in single family residences, condos, golf course homes & condos, ocean front homes & condos, investment properties, and 1031 Tax Exchanges. Both are former educators, who have lived in the area their entire lives, which affords them knowledge to assist you with not only your real estate needs, but also provide you with information regarding schools, employment , and other issues involved in relocation. 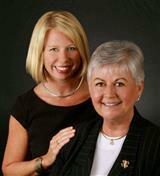 Kristi and Jewell attribute their remarkable success to previous clients, repeat business and referrals. They welcome the opportunity to serve you and bring you into the "Knight Team" Real Estate family.